In addition to my 1:12 collection and creations I love collecting for, and displaying my Lundby dollhouses from the late 60s and 70s. Lundby is a Swedish dollhouse company, famous for miniatures which accurately reflect modern furniture and interior design trends. I am a fan of retro furniture, so retro in miniature is right up my alley. This house dates from approximately 1967. I came across it in Sweden and had it sent home to Australia at great expense! It is in great condition though, with its original legs. Legs can be hard to come by. I am also still searching for its original TV antennae. I have tried to fill it with original furniture (as accurately to its date as possible). I did so with the help of many old Lundby catalogues I downloaded from the internet. I haven't entirely filled it yet because 1960s Lundby pieces are hard to come by. It is a slow labour of love. 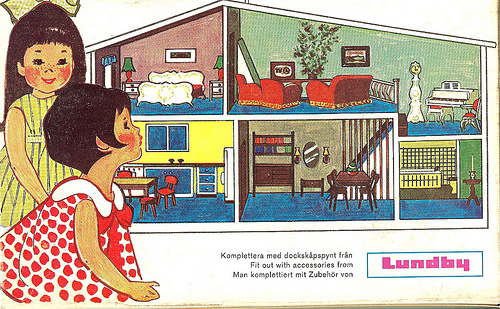 I also came across a Lundby house in Australia at a garage sale a little while ago (see below). I think this house is from the early 70s. It isn't fully furnished yet, but I'm slowly working on it, scouring eBay and other online Lunbdy site. I have also got a small collection of Brio pieces too. Brio made some fantastic toys in the 60s and 70s which perfectly emulated the fashions of the time. 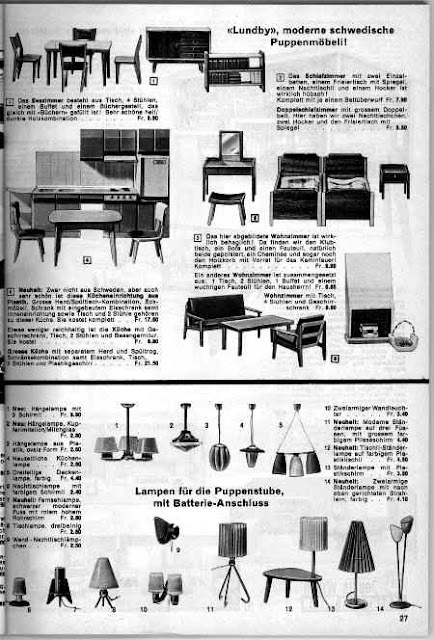 Brio worked with contemporary designers such as Arne Jacobsen, to create designer furniture in miniature. Below is the famous "egg" chair in 1:16 scale. If you want to know more about vintage Lundby, check out one of my favorite blogs, The Shopping Sherpa or the We Love Lundy Club. This is just great. It is such a nice collector piece and everything looks like it is in excellent condition. Thanks Giac! Do you have any other collections like this? I'ma fraid not. I was a hyper child and all my toys were...used to their full play potential. I never really collected until I started workin on my manor. Wow! the Manor is your FIRST project? That is amazing, you are very talented. Lovely vintage Lundby house. You have some amazing old pieces. I enjoyed your photos much. Thanks Amy, they took a long time to find! I'm glad you like them. I'm glad you liked it! I love your selection of houses - I am very jealous in fact! I will keep an eye out and admire your new acquisitions as they come along. I had a lundby house as a child. We brought it out with us from Germany in 1971. I think my mum ditched it at a garage sale in the 80s. How I wish I had it now. That room on the right bottom was the bathroom in mine. It also had lights that worked. I think I'm going to attempt to build a replica one day (when I retire). Thanks for sharing your pictures, they are ace!